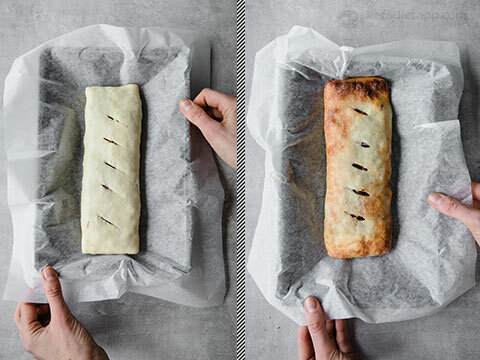 If you’ve not tried our Keto Hot Pockets yet, you’re in for a treat. 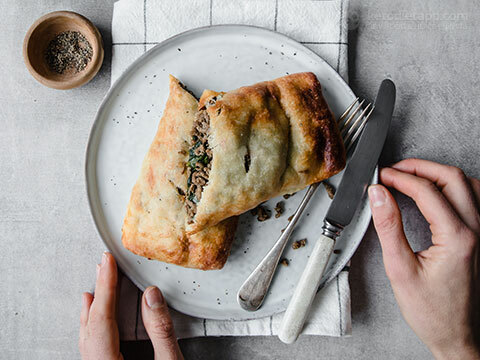 These spicy beef hot pockets are packed full of flavour, not too hot but if you’re a chilli lover you can totally up the anti and go chilli mad. 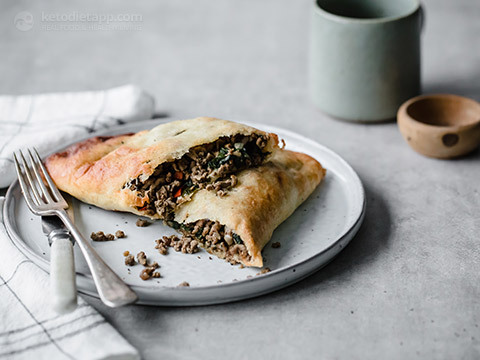 I served these low-carb spicy beef hot pockets to Mr B (my food critic and chief taste tester) and I couldn’t help but chuckle at the big thumbs up, you’re through to the next round wave. He thinks he’s John Torode off Masterchef! LOL! 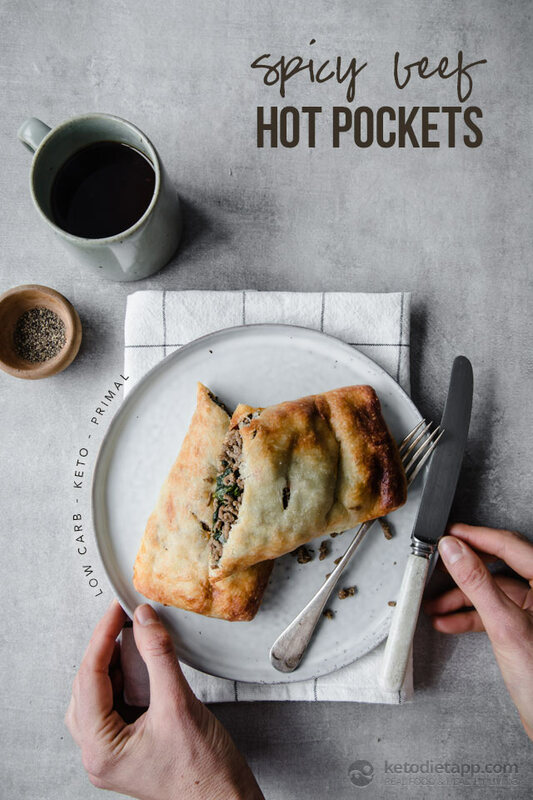 These keto-friendly hot pockets make a great low carb lunch idea or comfort food dinner, served with a simple side salad. Preheat the oven to 200 °C/ 390 °F (conventional), or 180 °C/ 355 °F (fan assisted). Chop the onion and garlic. 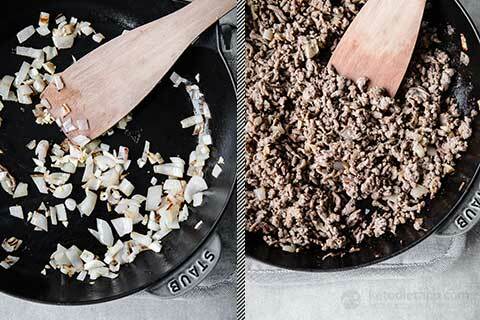 Heat the ghee in a non stick or cast iron pan on a medium heat. Add the onion and fry for 2 minutes until soft. Add the garlic for a further 30 seconds. Add the beef and cook for approximately 5 more minutes until cooked through, breaking the mince up with a spatular until fine. 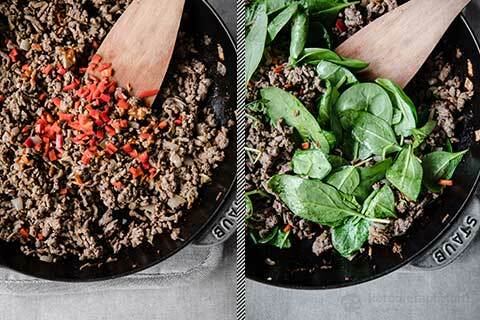 Add the chilli, coconut aminos, sriracha and season to taste. Stir through the spinach, cooking for 1 - 2 minutes until wilted. Turn off the heat and place to one side. Melt the mozzarella in a microwave for about 60 seconds until the mozzarella melts. 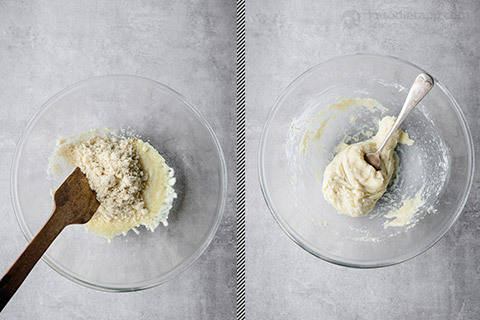 Add the almond flour and mix to combine to form a dough. 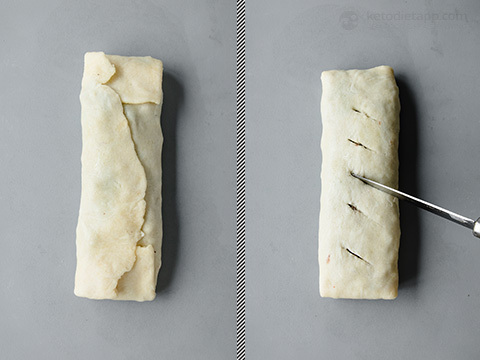 Roll between two sheets of greaseproof paper or one sheet and a silicone matt. 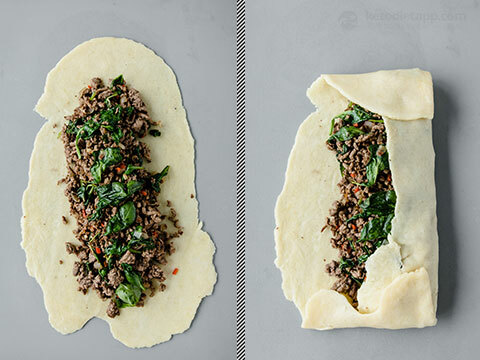 Place the chilli beef mixture in the centre and fold to seal the dough. Careful prick or slice a few air holes in the top. Place on a greaseproof lined baking tray and bake in the oven for about 20 minutes or until golden. Best served fresh - enjoy! The pockets can be frozen for 2 months and then placed in the oven to reheat. Mozzarella and almond flour, what an interesting combination! Can't wait to try it. I don't have a microwave, can I melt the mozzarella in the oven? I think you can but keep in mind you only want to melt it, not bake/crisp it up, so low temperature and/or covering it with a lid should help. You'll need to keep an eye on it. Alternatively, you can melt it on the stove (low heat) while stirring. Thank you for answering the question. Sorry, I didn't realize, this recipe was from Jo. 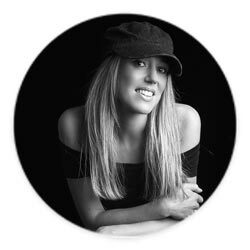 Thank you Jo for this great idea. I am going to try it!! Superb, just had it for lunch from the leftover bolognese sauce. Thanks for the recipe, the dough was perfect. Thank you for your feedback Ilija! 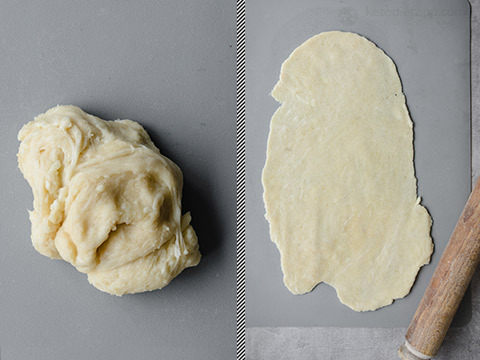 Why is it that my dough doesn't yield as much as the recipe says?